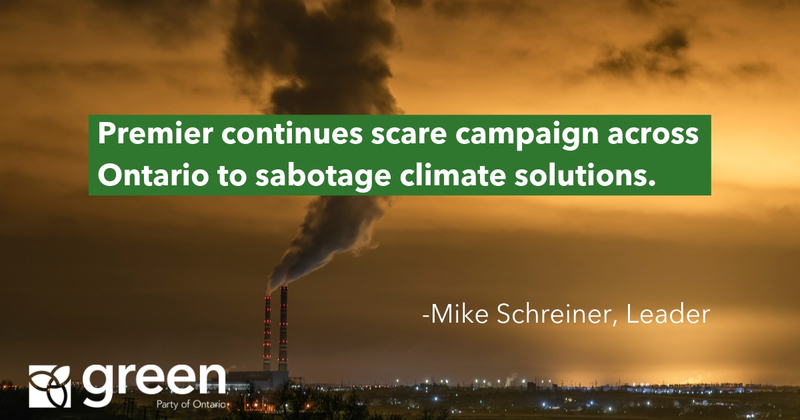 “The Premier continues to waste money on his scare campaign to sabotage climate solutions. Today’s announcement was not about helping farmers. It was another stop on the Premier’s climate denial tour using tax dollars to play politics and take down the Prime Minister. Why is Doug Ford more worried about the federal election than doing his job as Premier? And how ironic that he went to Oxford County to trumpet his anti-climate efforts, when this was the very first municipality in Ontario to set a target of 100% renewable energy. The Premier once again spread mistruths about pollution pricing, claiming it is unnecessary to reduce emissions. His comments are in direct contradiction to the advice of Nobel-prize winning economists, academics, and scientists. The Premier also repeated his pride in cancelling renewable energy projects across Ontario and rallying other provincial leaders to sabotage national climate action. This leaves us all to wonder whether he understands the climate emergency we face.